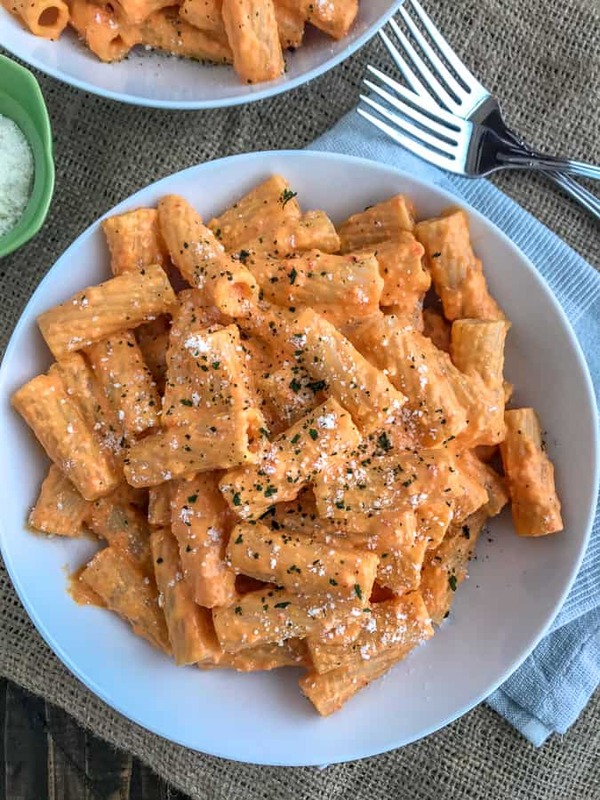 This Roasted Red Pepper Rigatoni is an easy-to-make, flavorful pasta dish that is going to knock your socks off! Made with a handful of ingredients and comes together in under 20 minutes. 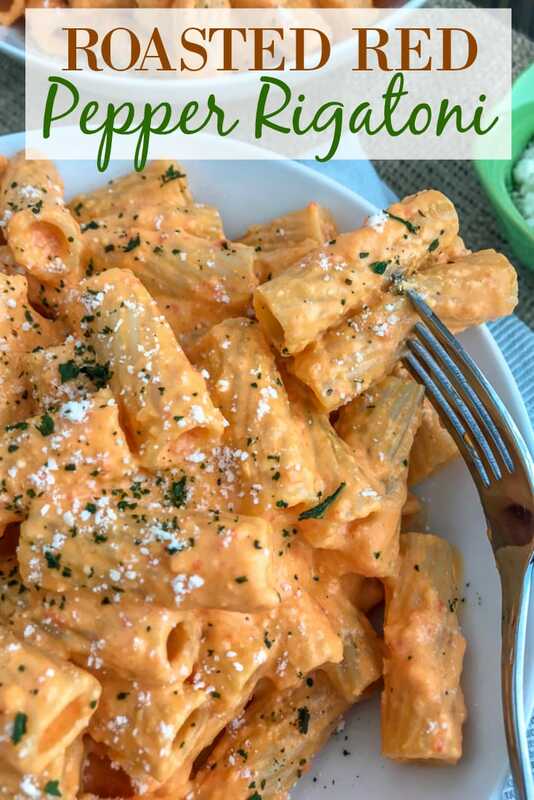 Creamy, savory-sweet red bell pepper sauce garnished with basil and parmesan cheese. Light, on the healthy side of things, and the perfect comfort dish to get you through these never-ending cool months. Sure to be a repeat on your table tonight! Yum! Yum! YUUUM! That is all I have to say about this dish. This recipe comes together, from start to finish, in 20-25 minutes. 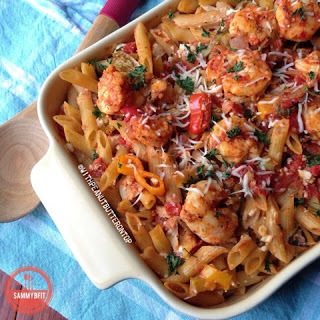 It’s quick and easy, making it the best dinner option for you tonight. Trust me, you are going to want to make this. I may be saying this because I am a complete carb-ivore, but I cannot think of anything better on a week night (or week day if I’m completely honest) than a super simple pasta dish. And yes, you read that correctly. I said CARB-ivore. 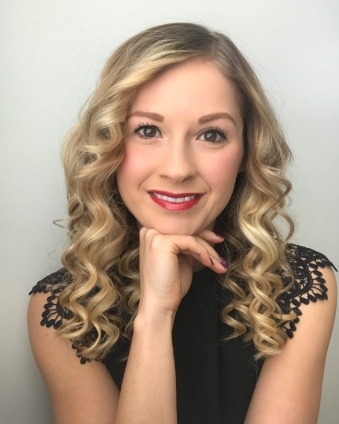 Rather than a carnivore (that consumes meat), I consider myself a CARB (carbohydrates: pasta, breads, etc)-ivore. I think many of you can admit that you are to some degree. No shame here, so don’t worry about your own. If you bring me some form of carbs — we are instantly friends! Carbs simply make me happy. Easy recipes during these busy holiday months? Even better! Especially when the dish is made with minimal ingredients and done so effortlessly. You can serve this as is, or with added protein for a complete meal. 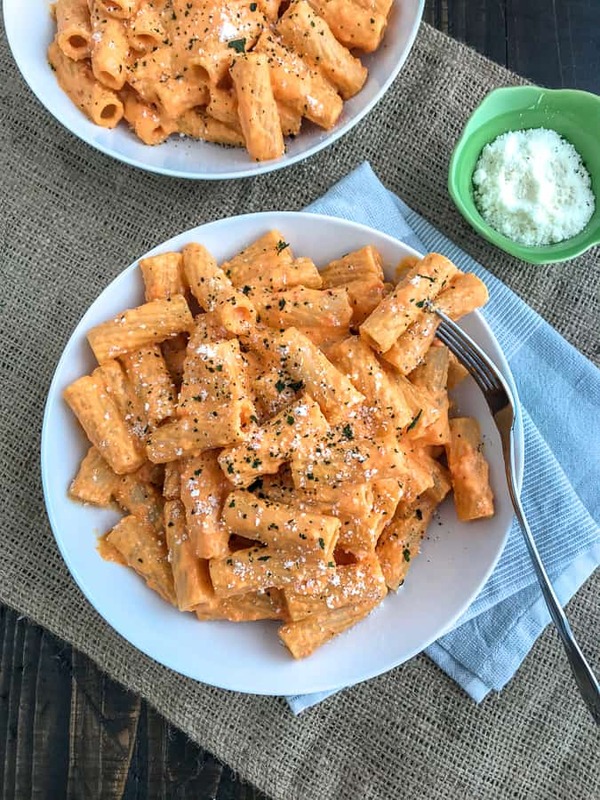 The first time I tried my hand at a roasted red pepper sauce, I have to admit – it was a flop. The sauce came out too thick and as pasta knowingly does — it soaked the sauce up so quickly that I was left with chunky globs of noodles. The flavor was there, but the creaminess was not. Let’s not even talk about presentation! Knowing I had the flavor on lock down, I knew I couldn’t quit until I perfected this dish. So, as with all things – practice makes perfect! I changed things up a bit and was pleasantly surprised with the results. Sometimes even changing the pasta can turn a dish around. 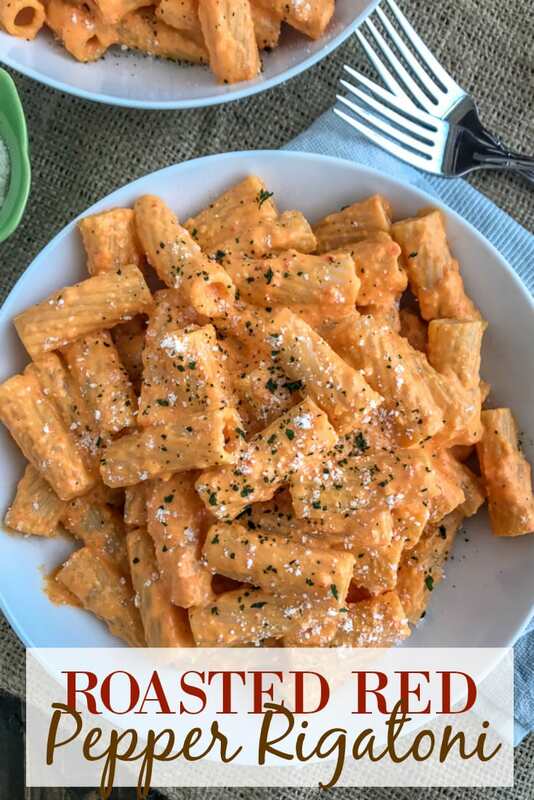 Which is exactly what this rigatoni did. 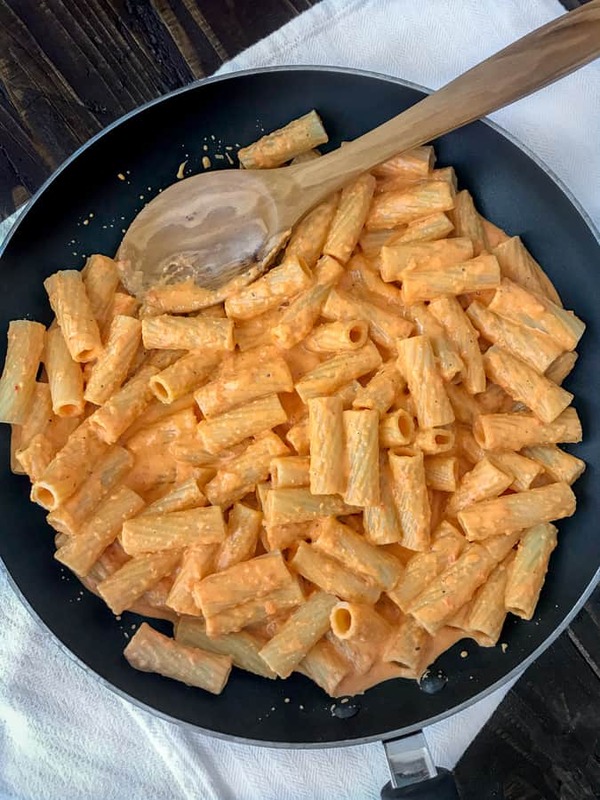 When choosing pasta, choose one that is going to hold on to the creamy sauce – like you see pictured below with the rigatoni. Look at all the ridges and the centers holding the sauce. Think of this sauce like you would a Baked Macaroni and Cheese. You want it to fill the ridges or crevices. 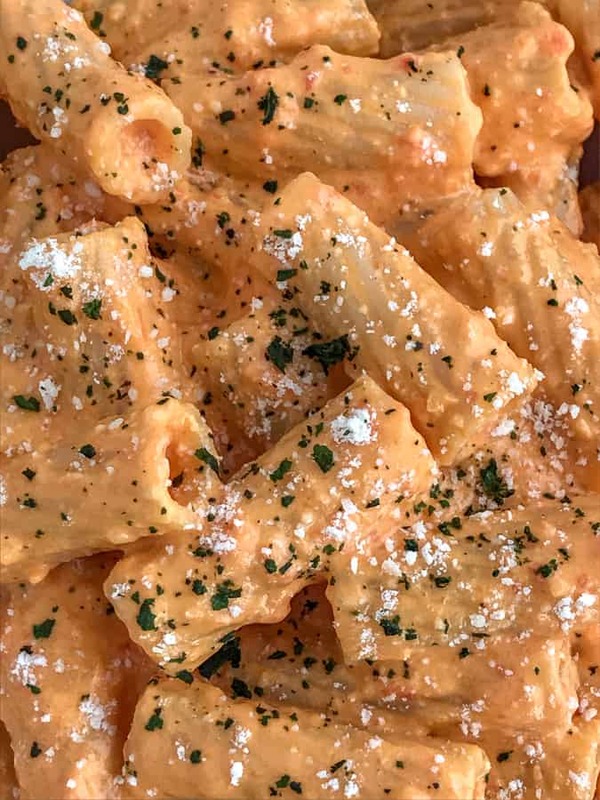 If you don’t have rigatoni, you can use bowtie, penne, elbow, ziti, or macaroni. I recommend carefully pouring the sauce into a food processor or blender to fully puree the ingredients. You don’t want to be left with any chunks! I have a Hamilton Beach Food Processor and it works like a dream for me. I received one as a wedding gift 8 years ago and the only reason I ended up with a new one was because I had accidentally dropped and cracked the bowl! Cream cheese will melt quicker and easier if it is first softened to room temperature and then sliced into small cubes prior to being added to the pan. Forget to take it out of the fridge in time? No problem! Simply place it close to (but a safe distance from) the burner when your pot of water is coming to a boil. I generally place it on the stove (I have a glass top) and it warms enough to soften it. Come on now! How can your tummy not rumble looking at that creaminess?? 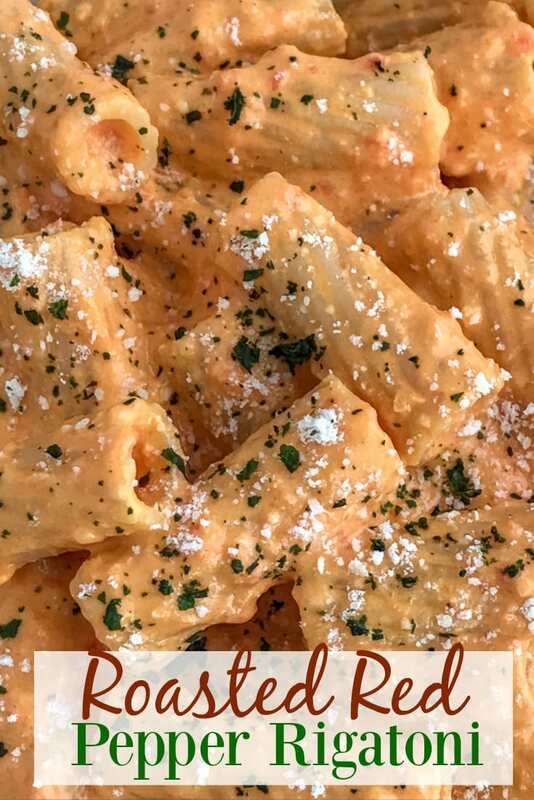 Baked Macaroni and Cheese – another creamy, easy-to-make pasta dish that is perfect for carb-lovers! Looking for the perfect comfort dish? Then look no further! Mac and cheese is where it’s at and we both know it. Easy One Pot White Chicken Chili – keeping with simplicity – try this easy, one-pot chili recipe. Full of delicious chili flavors, but made on the lighter side to be enjoyed without the guilt. Easy Instant Pot Chicken Taco Soup – stay warm with this super simple taco soup! Comes together in no time and all in the instant pot. A popular recipe of mine and one of the most remade recipes on my blog – for a reason! YUM! Honey Garlic Chicken Lettuce Wraps – a low-carb, easy recipe that comes together in minutes. Great for lunches, meal prepping, or if you’re trying to keep healthy in between the holidays. Because the holidays are hard enough on our waistlines. Am I right? Creamy Cilantro Lime Chicken – a one-pan recipe that is bursting at the seams with flavor! Perfectly paired with Cilantro Lime Black Bean and Corn Cauliflower Rice, a side salad, or Creamy Mashed Sweet Potatoes! 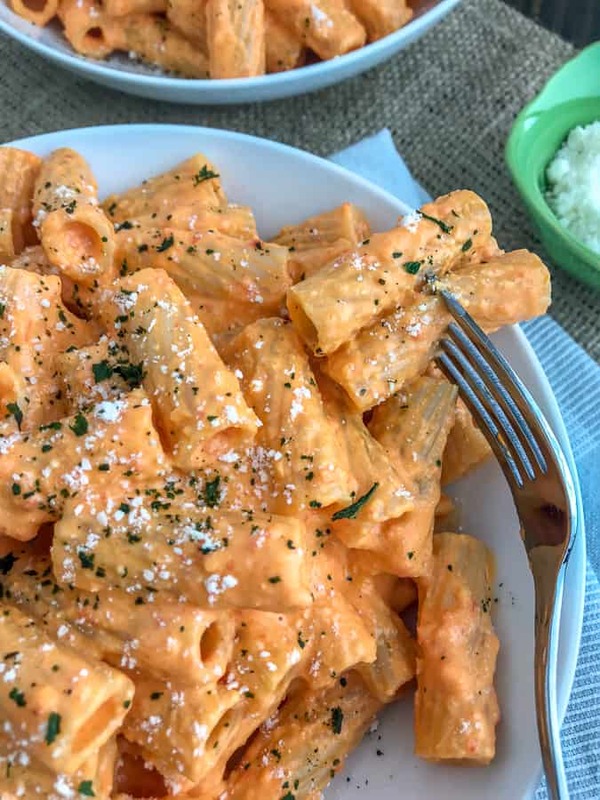 Creamy, savory-sweet roasted red pepper sauce that comes together with a handful of ingredients and under 20 minutes. Easy, flavorful, and incredibly delicious. Bring a large pot of salted water to a boil, cook pasta according to the instructions on the package (each pasta varies). Drain well and return to pot. While the pasta is cooking, heat butter in a large sauce pan over medium heat. One melted, add the sliced shallots and cook until translucent; 2-3 minutes. Add the minced garlic and cook 1 minute. Pour in half-and-half and stir to loosen any onions or garlic. Add the parmesan cheese and cream cheese. Stir frequently for 2-3 minutes, or until cream cheese has melted. Add the roasted red peppers to warm. Safely pour the sauce into a food processor (or safe dish to use an immersion blender) or blender and puree until creamy. Taste test sauce and season with salt and pepper, if desired and to taste. Pour the sauce over the pasta and gently toss to coat. 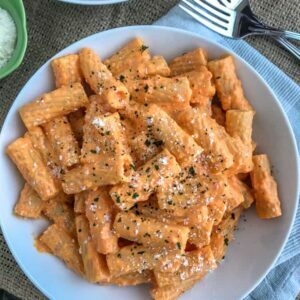 Serve garnished with fresh basil and parmesan cheese. Enjoy! I recommend carefully pouring the sauce into a food processor or blender to fully puree the ingredients. You don't want to be left with any chunks! I have a Hamilton Beach Food Processor and it works like a dream for me. I received one as a wedding gift 8 years ago and the only reason I ended up with a new one was because I had accidentally dropped and cracked the bowl! It turned out fantastic thank you! Blending it up worked well to trick my husband because he hates peppers and onions. Haha but he never knew and even went back for seconds!